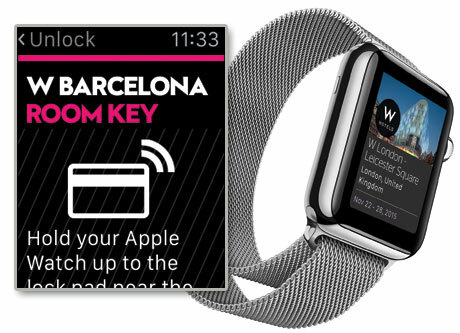 Starwood Hotels & Resorts Worldwide has launched an app for the Apple Watch that enables wearers to tap their device to unlock hotel room doors via Bluetooth. The SPG (Starwood Preferred Guest) app incorporates the SPG Keyless door entry system, which has been available for iPhones and Android devices since November 2014. “The Apple Watch is an extension of the iPhone,” the hotel chain explains. “In order to use SPG Keyless on your watch, it must be connected to your iPhone, which in turn must have the SPG app and be registered for SPG Keyless. Bluetooth must be on to unlock your door with your Apple Watch. Currently available in more than 100 Aloft, Element and W hotels, SPG Keyless is rapidly rolling out and will soon be available on 30,000 doors in 150 hotels around the globe. Guests open doors with an NFC-like gesture, where the device is held in close proximity to the door’s Assa-Abloy supplied lock until a green light indicates it has unlocked.